Teams of 4-6 people. £5 per person. Tickets available online here or at the East Lothian Camera Shop. In development, come back soon for more details! December 2018: Carol Singing at ASDA & ALDI Tranent: £300 thank you! Friday 16th November 2018, 7pm: Singo. £860 thank you! Saturday 7th April 2018, 11am: The Cuds in Reel Time. Free awareness event. Saturday 14th April 2018, 10am & 10.45am. Toddler Cinema Double Bill! £100 thank you! Friday 23rd March 2018, Fundraiser at Bellevue Retirement Home in Dunbar: £300 thank you! 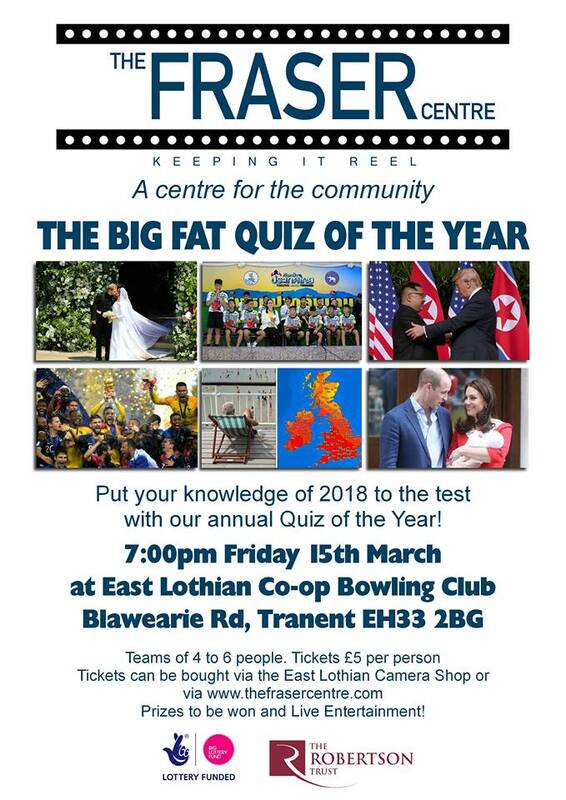 Friday 23rd March 2018, Tranent Bowling Club: The Big Fat Quiz of the Year! £870 Thank you! Saturday December 2017 ASDA Carol Singing: £237 thank you! Saturday 30th September 2017 10am-4pm: Clearance Sale. £1100, thank you! Wednesday 20th September 2017, 6.15pm: Bethany Halcrow Yoga Fundraiser. £26.40 thank you! Saturday 16th September, 2017 12.30pm: Winton Cinema Talk. Free Entry donations at the café. Friday 1st September 2017, 7pm: Singo at Tranent Bowling Club. £755 raised, thank you! Wednesday 30th August 2017, 6.15-45pm: Bethany Halcrow Yoga Fundraiser. £33.60 thank you! Saturday 15th April, 1-3pm: Awesome Lego Competition. £158 thank you! Saturday 4th February 2017: Big Fat Quiz of the Year. £200 thank you! Friday 25th November, 2016 7pm, 2016. Talent Night. £935, thank you! Saturday 9th April 2016: Lego Competition. £100, thank you! Friday 30th January 2016, 7pm. 2016: Glenkinchie Whisky Tasting event raised £335.00, thank you! Friday 23rd January 2016 7pm, 2016: Burns Dinner & Ceilidh event raised £172.00, thank you! Friday 4th December 2015, 7.30pm, 206: Big Fat Quiz of the Year. £300, thank you! Saturday 28th November 2015, 2-5pm, 2016: Christmas Craft Fair. Past event raised £344.57, thank you!